We are a few weeks away from the shortest day of the year, and the sky has closed in around us here in Sleepy England. The whole country feels a bit lethargic as we wait for the merry-making to set in. At this time of the year, I find that I crave more red meat than at any other point. I tend to go quite long periods without eating beef, or any meat for long periods of time, but come deep, dark December, I’m on a stews, braises, and roast regime. I know a lot of people shy away from making steak at home, but honestly it’s so much for satisfying eating it in your PJs, than in a stuffy restaurant. I usually go for rib-eyes because they take minutes to cook and have incredible flavor. The key to steak is to salt the steak on both side, at least 15 minutes before you cook it. The other key is a cast iron pan, heated until it’s blindingly hot. Open a window, take the batts out of the smoke detector, it will be fine. 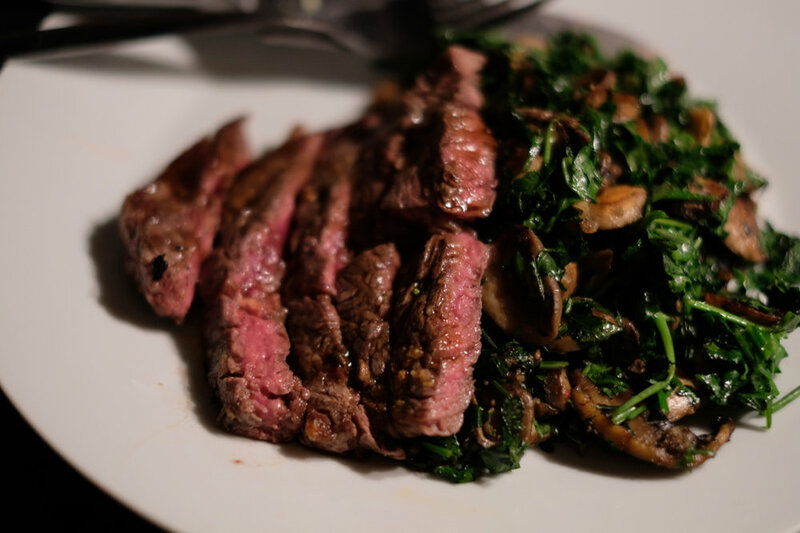 I think the great thing about a steak is that it’s such a satisfying meal over a bed of arugula (roquette for my Brits) or in this case simple sauteed mushrooms. Take your steak out of the fridge at least 20 minutes before you have to cook it. Salt it with kosher or flake salt on both sides, pepper too. While the meat is resting with the salt on it, put your pan on a high flame. In the meantime, slice your mushrooms and chop your parsley. In another non-stick pan, as a generous knob of butter and the minced garlic. Swirl around and allow to get bubbly, then add your mushrooms, keep your heat at medium high and let your mushrooms alone for a few minutes a side, so they get really golden. When your pan is very very hot, add your steak, and crushed garlic and rosemary sprig around it. Don’t touch it for 3-4 minutes. Don’t touch it. Really. I mean it. Flip it. Leave it for 2 minutes. Then add a knob of butter to the pan and swirl around the bottom of the pan. Lift the steak out with a metal spatula and let rest. Add red wine, or sherry or balsamic vinegar to the pan and/or a little stock. Simmer and reduce for a few minutes on high heat. 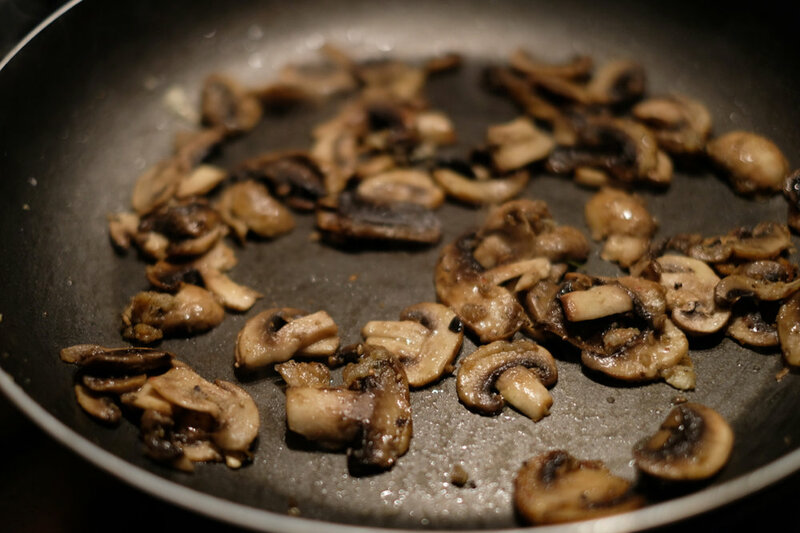 Add the parsley to the pan of mushrooms and a glug of apple side vinegar or a squeeze of lemon juice. You can slice or not slice the steak, and serve with the mushrooms.